Originally uploaded by Somewhat Frank. MapMyWord is an interactive graphic dictionary and thesaurus, which dynamically draws color-coded representation of words, relationships (16 types), and meanings in radial clickable graphs. Check out VocabGrapher, which is a full-featured desktop version. “Learning vocabulary through graphs” is fun, effective and even addictive for someone like me whose English is 2nd language. So, what’s are Widgets (Google call them Gadgets)? 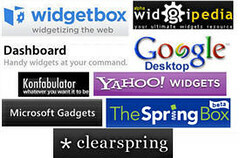 Widgets are small, simple applications that allow the user to perform common tasks or monitor important information. I want to write one at work. But, how? An open standard development infrastructure which would allow a single widget to be plugged into any application and work properly seems to be something the widget movement is currently lacking – it may be a pipe-dream but I think it is worth wishing for. Hmm. Is there any development in that recently? I need to check this out. Enterprise Widgets are a UI channel suitable for quick enterprise transactions, light-weight tracking and monitoring, and other interactions that users want close to their everyday work. Enterprise Widgets can be components of Enterprise Dashboard ( Digital Dashboard). Will 2007 the year of the Widgets? BTW, MapMyWord is also available for Netvibes. I’ve also found the Sparkline Stock Charts gadget.